Great weather today for a ride! Took a day off, and headed east to Globe AZ for a downhill run on SixShooter Canyon Trail. Unfortunately.... part of the rear triangle on my Titus Motolite snapped. Pure stress fracture, or metal fatigue? (very clean break) Bummer.. had to end the run early and head home, while everyone else took another trip down. This is a great trail, just an hour and a half east of Phoenix! Thanks Sam for the middle finger, quite appropriate! finished up the lower part (check dam) portion. Hey Tim-may! Great riding with ya. 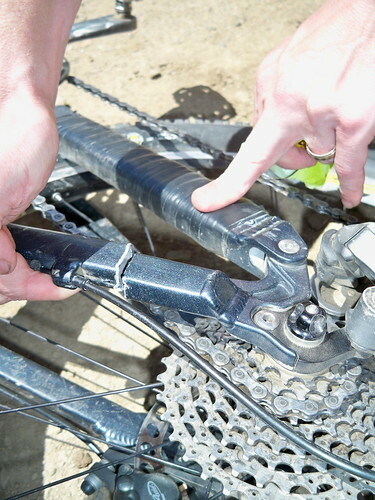 Get your bike all healed up and we'll roll again. Neato post, hope you don't mind that I linked up to it.